I am just a tad over that dreaded big 30 mark. The worse part of it is my kids have giving me wrinkles and age spots. My skin especially on my face has really been through the wringer lately. I have wrinkles, age spots, uneven skin tones, alot of redness, dry patches, and very oily T zone. I even still get blackheads and acne. I am so beyond my moody skin. I so needed something to feel beautiful again. I am sick of covering up with makeup everyday plus I never have time to even put the makeup on. So when I got the chance to try out Simone France skin care products I couldn't wait. I got a full skin care analysis for free and then they sent me the perfect products that match my skin and to make my problems area get better. So when they arrived I couldn't wait to try them. I got the Sandwich collection which is the soap, the light moisturizer, disposable cleaning cloths and the gentle scrub. This collection I was to use in the morning every morning. Then I got my evening cleansing set which contained the light milk an d the gentle toner. I started using them the very next day. I could tell a huge difference in just my first day of the regimen. My skin was softer and looked cleaner and healthier. I have now been using the routine for about 2 weeks and I must say my skin looks and feels great. I don't have to wear makeup anymore other than mascara. The redness is gone and my skin color is even. It is very moisturized without being over oily. My fine lines and wrinkles are gone and so are my huge pores and I even have alot less blackheads on my nose and face. I was nervous because I have very sensitive skin and I breakout from everything. I didn't break out or rash out using this I was so happy that I found something that works and didn't irritate my skin. 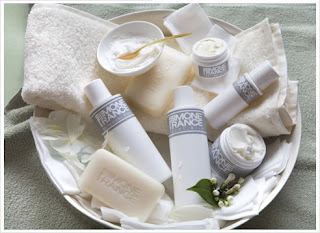 So if you have crazy skin or just skin that is a problem for you then you have to check out Simone France skin care products. I know you will love the products and will look gorgeous after using them. So head over check out all their great products. I have sensitive skin so this may be something new for me to try.